CLD Fencing Systems have supplied half of a Kilometre of Bespoke Velodrome Fencing for Palmer Park Track; Reading. A joint funded scheme by British Cycling and Reading Borough Council has seen over £350,000 invested into the Palmer Park Sports Stadium, including new velodrome fencing, lighting and improvement to the cycle track. 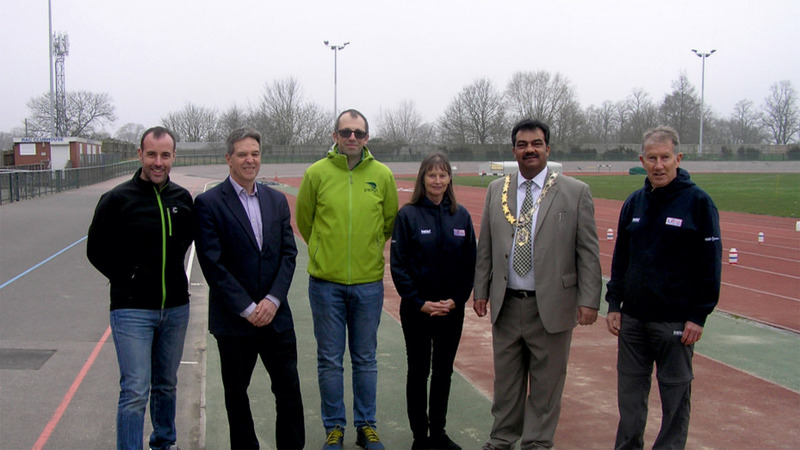 The new cycle track was opened to the public on March 11th 2017 by the Mayor of Reading, Mohammed Ayub and representatives from British Cycling. The original Velodrome track fencing, which can be seen in the photograph to the right, featured a raft of boards with concrete posts which needed to be renewed. British Cycling were able to both help specify and fund the replacement cost of the fencing for the project. CLD Fencing Systems Velodrome Track Fencing has been specified on a number of British Cycling funded projects including Preston Park; Brighton, University of York Sports Village; York and a wealth of other Velodromes up and down the United Kingdom. Designed, manufactured and supplied direct from its factory in Cheshire; the new track fencing features a host of safety features that are unique to the CLD Velodrome Fencing System and Gates. Developed with the cyclist in mind, it is a cycle specific version of their Sports Rail system that has been used on sports projects ranging from Premier League Football Clubs, Hockey Pitches, Rugby Clubs and local soccer teams.